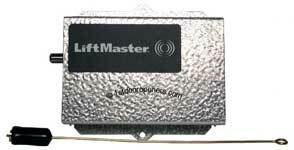 Below are the LiftMaster garage Door openers receivers and compatible remote control transmitters for each receiver. 115 Volt Plug-In Universal Radio Control Only. 315 Frequency. Rolling Code, Security +, purple learn button. Replaces older or discontinued model remotes and receivers. Compatible Keyless Entry, 377LM or 877MAX. Works with openers manufactured from 2005, that have a purple learn button. Featuring Enhanced Radio Technology (ERT). 115 Volt Plug-In Universal Radio Control Only. 390 Frequency. Rolling Code, Security +, orange or reddish orange learn button. Works with openers manufactured between 1997- March 2005. Rolling Code, Security +, orange or reddish orange learn button, 390 frequency. Replace 335LM Universal Radio Control. Replacement receiver for 3 wire control systems ONLY. Mounting Clips and Instructions included. Stops Code Grabbers Cold !! The receiver can be powered with either 24V AC/DC or with 12V DC. The jumper must be in the 24V position for use with 24V, and in 12V position for use with 12V DC. The jumper must be set to the proper voltage to avoid damage to the receiver. The 312HM Universal Receiver can be used with up to 15 315MHz rolling code transmitters or passwords in HIGH security mode. 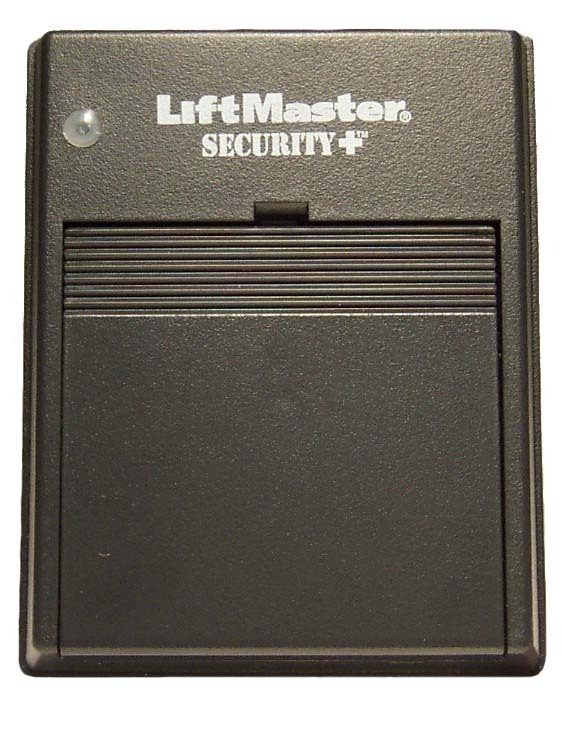 Alternately, it can be used with up to 31 of any type LiftMaster/Chamberlain (315MHz) transmitter in NORMAL security mode, including any combination of rolling code, billion code, or dip switch remote. Includes receiver, antenna wire and instructions. Optional 24 volt power supply 85LM pictured below. If the power is other than shown in specifications, accessory transformer model 85LM or 95LM (shown below) is required. This receiver can be used with a multi-function remote control to operate three residential garage door openers or with a three-button door control (333LM) to OPEN-CLOSE or STOP a commercial garage door opener. Compatible remotes are 361LM, 362LM, 363LM, and 333LM. The 333LM is used in OPEN-CLOSE-STOP applications. The receiver and antenna use TV Type F coaxial connectors. The antenna can be plugged directly into the receiver or mounted to a bracket and connected to the receiver with model 86LM coaxial cable kit (shown below) for extended range. If the power is other than shown in specifications, accessory transformer model 95LM (shown below) is required. Model 86LM coaxial cable kit (shown below) is also available. No wireless keyless entry is currently available. The 412HM Universal Receiver can be used with up to 15 rolling code transmitters or passwords in HIGH security mode. Alternately, it can be used with up to 31 of any type LiftMaster/Chamberlain (390Mhz) transmitter in NORMAL security mode, including any combination of rolling code, billion code, or dip switch remote. Includes receiver, antenna wire and instructions. Accessory Transmitters - Series 50, 60, 80 and 900. This universal receiver model 422LM can be used to operate two residential garage door openers or entry ways with model series 60 (61LM, 62LM, 63LM, 64LM) code switch remote controls having red indicator lights and up to four model series 80 (81LM, 82LM, 83LM, 64LM) "smart" remote controls with green indicator lights. In general, code switch remote controls are used when several persons are operating the same device. The code switches must be set to matching positions in all remotes controls used to operate the same receiver. Accessory Transmitters - Series 50, 60 and 80. This receiver can be used with a multi-function remote control (62LM, 63LM, 64LM, 82LM, 83LM, 33LM) to operate three residential garage door openers. 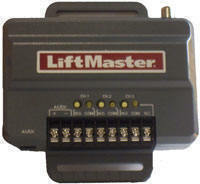 OR with a three button door control to OPEN, CLOSE, or STOP a commercial garage door opener. Use 33LM remote control for commercial open, close, and stop operation. Accessory Transmitters - Series 50, 60, 80 and 33LM. Controls up to three Gate Operators or Commercial Door Operators. Provides convenient access to gated communities, industrial facilities, and commercial sites all with a single transmitter solution. Supports up to 90 remote controls and 6 Keypads. Channel 1 will except up to 50 remote controls and 2 keypads. Channel 2 and 3 will each do up to 20 remote controls and 2 keypads. Relay Outputs: Output channels - 1 FORM C and 2 FORM A relays. Narrow-band on 310 MHz, 315 MHz, and 390 MHz Security+ 2.0® Rolling Code and Encrypted DIP. If your operator does not meet the power specifications you will need a transformer. 85LM plug in transformer or 95LM wired in transformer. Compatible with remote controls models 811LM, 813LM, 891LM, 893LM, 890MAX, 893MAX, 895MAX, 892LT and 894LT. Not for use with MyQ enabled garage door openers or devices. Accessory for the 65LM hard wired keyless, 412HM, 312HM receiver, 335LM radio control. For use with all types of add-on wire-in gate and garage door opener receivers. Accessory for the 65LM hard wired keyless, 422LM & 423LM coaxial receivers. For use with Models 312HM, 422LM, 412HM, 423LM, 860LM and 323LM when remote operation is needed. Kit contains antenna bracket and 15' of cable.